When it comes to living the active life you want, healthy bones are key. Natural supplement NativeRemedies® BoneBuildPro™ works from the inside out to help temporarily relieve joint and bone pain while promoting mineral absorption for greater bone strength. All Native Remedies homeopathic products and biochemic tissue salts are manufactured in a FDA-registered and cGMP-compliant pharmaceutical facility under the supervision of qualified homeopaths and responsible pharmacists. Individual ingredients are listed in the Homeopathic Pharmacopoeia of the United States (HPUS). *These statements have not been evaluated by the Food and Drug Administration. This product is not intended to diagnose, treat, cure or prevent any disease. Bone and joint supplement helps relieve discomfort associated with a weak spine. Supports kidney health to reabsorb minerals. Spray bone health supplements directly into mouth 3 times daily. 2 fl. oz. pump bottle lasts approx. 60 days. Calcarea carbonica is a homeopathic ingredient suited to those with impaired nutrition in the glands, skin and bones, often resulting in minor back and joint pain. Calcarea fluorica is a powerful tissue remedy homeopathically recommended for bones, teeth and joints, as well as musculoskeletal problems such as aching joints. Calcarea phosphorica is another homeopathic remedy specifically recommended for people with bone and teeth problems, minor pain and stiffness in the back and neck, and those seeking relief from minor joint and bone pain. Equisetum hyemale is a homeopathic ingredient which is made from the horsetail plant. Equisetum has a powerful influence on the kidneys' action to eliminate waste and reabsorb minerals. Hekla lava is a homeopathic preparation of volcanic ash which is high in minerals, including Silica, Magnesium and Calcium. It is an ingredient helpful for those with bones that tend to progressively weaken over time. Phosphorus is a homeopathic remedy suited to those with bone fragility and for those with a craving for cold drinks and salty foods. Silicea is a specific homeopathic remedy for those with skin, teeth and bone problems as well as brittle, weak nails – often associated with poor absorption of minerals in the diet. It also temporarily relieves minor pain throughout the hips, legs, knees and feet, and helps with fatigue and weakness. How do I use BoneBuildPro? Before initial dose, depress pump 4-5 times or until primed. Hold close to mouth and spray directly into mouth. Use 3 times daily. Use additionally as needed or until symptoms improve. 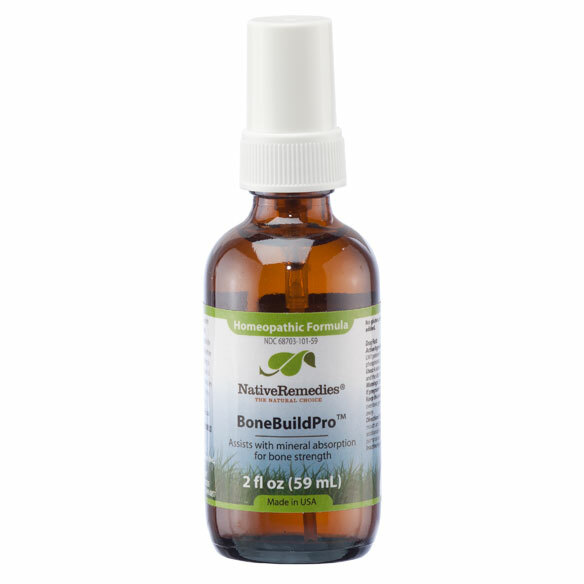 BoneBuildPro is a homeopathic remedy and is safe for all ages. There are no known drug interactions. Caution: If pregnant or breastfeeding, ask a health professional before use. If symptoms persist or worsen, consult a health care professional. Keep from the reach of children. Avoid strong mint-flavored candy, as this may reduce the effectiveness of the remedy.